Mapping caves is an important endeavor for numerous reason. Cave maps do not show where caves are located, but rather what’s in the interior. Maps show in what directions cave passages lead, how long they are, other characteristics and the features they contain. A map can be important to a variety of scientists and hobbyists who study the geology, hydrology, cave biology and explore caves. A geologist may be able to interpret how the cave formed by studying a cave map or group of cave maps. A hydrologist may be able to determine drainage patterns by looking at cave maps. A biologist can plot locations of biota on a map to determine why biota prefer certain habitats within the caves. A beautifully drafted map is also pleasing to the eye. More than one cave map graces the walls in homes of cavers and cave owners. Mapping has come a long way since cavers began mapping caves several decades ago. Today, instruments that are more precise are being utilized and better caving equipment allows mappers to survey cave passages that were beyond the capabilities of cavers decades ago. Generally, maps have become more detailed with the advancement of caving and mapping techniques. The use of cross sections and profile views give both the caver and the speleologist a better understanding of the caves depicted on maps. A cave survey team consists of positions known as lead tape, back tape, lead instruments, back instruments, book and sketcher. Although there are six functions listed, as few as two people can perform all six tasks. When there are fewer people involved, lead tape and lead instruments can be performed by one person, back tape, back instruments, book and sketcher can be performed by another. Ideally, for ease and efficiency in most cave surveying, there should be at least three people – lead, back and book/sketcher. An open reel fiberglass tape divided into feet/tenths of feet or metric, or a cord divided into feet/tenths of feet or metric. The tape is stretched between one survey station and the next where there is a direct line of sight between stations. The tape or cord acts as the spine or framework of the survey. Even in the day of electronic distometers, the survey tape serves an important role. Distometers are very useful in determining passage heights, passage widths and distances from the stretched survey tape to specific objects that will appear on the map.Compasses are used to measure the magnetic azimuth from station to station and from one object to another. Azimuth is graduated from zero (magnetic north) in 360 degrees clockwise back to north. East is 90 degrees, south is 180, west is 270, north is 360 (or zero). Good compasses such as Suunto and Brunton are graduated every half of a degree. Readings should be to the nearest half a degree, and if possible, a good estimate to the tenth of a degree. Some Suunto compasses have two vertical bars in their view—an adjustable magnetic declination bar and the bar that marks the direction of the compass. Do not get the two bars confused. Clinometers (often called inclinometers) measure up and down angles from one station to another or from one object to another. Zero is absolute horizontal, 90 degrees is straight up, -90 is straight down. Clinometers are typically graduated every degree. On Suunto clinometers, there are two sets of numbers—on the right is percentage of slope, on the left is degrees of slope. Use the degree slope (left) set of numbers. 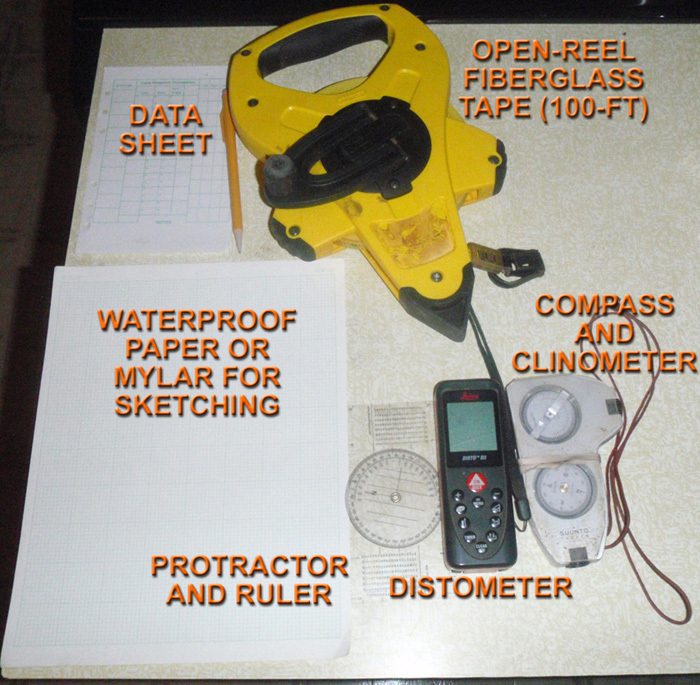 Book and sketcher: The “book” is a sheet of paper or Mylar on which all of the survey data is written—station from, station to, tape distance, compass, clinometer, back compass, back clinometer and the “LRUD” numbers. This acronym stands for left, right, up and down. From each station, distances are measured in these directions to each wall, ceiling and floor. The sketch is where the map is drawn, using a protractor, ruler and pencil to plot the survey shot and then draw in all of the features—walls, floor detail, ceiling detail, notation as needed. A more-or-less international set of map symbols are used. Memorizing the symbols makes for faster sketching that is understood later when it comes time to draft the final map at home. Neatness and legibility are crucial! Any ambiguity in the sketch will either result in a follow-up trip to the cave to resolve the mystery or result in a possible error on the map. How Long Does Surveying Take? Cave surveys take time. In a typical day, expect between 200 and 500 feet of survey, depending on the efficiency of the survey team and passage complexity and difficulty. A straight dry passage with adequate standing room, a flat floor and flat ceiling is much easier to map than a room full of breakdown and speleothems or an area with a difficult vertical pitch or a tight watercrawl. As much time will be taken to draft a final map in the comfort of your home or office as it took to survey the cave itself. What Skills are Needed to Survey Caves? Anyone can participate in cave surveys, no matter what your level of experience is. In five minutes, you can learn how to operate a survey tape and determine survey stations. With a few minutes of practice, most cavers can operate a survey compass and survey clinometer. Sketching takes a lot of practice and knowledge, but almost anyone can learn to draw a cave map. I can testify that I have little artistic ability. I draw slowly and use a lot of eraser! Nevertheless, in the span of 40 years, my sketching and drafting abilities have progressed from drawing crude maps to drafting the detailed maps I produce today. Even with minimal talent, I have acquired the skill level I have today with a lot of practice and determination. If I can do it, anyone can! Names of all who contribute to a cave survey will find their names on the cave maps they helped to make. On the Garrison Cave #2 map, for example, there are 63 names! That’s how many people contributed to the survey of a 4.7-mile cave system. In the old days, maps were drafted on a sheet of paper with a pen. Maps can still be drafted that way if other methods and tools that are more technologically advanced and more expensive are not available. Current technology involves computer drafting that uses plotting software such as Walls or Compass and vector drawing software such as Adobe Illustrator or Xara. Those who are interested in drafting cave maps can learn much by tutoring under an experienced map drafter. 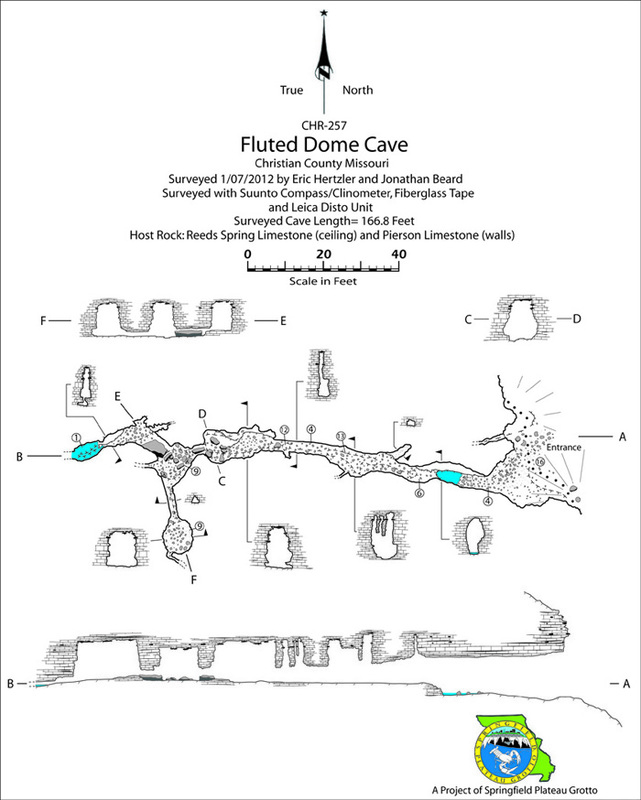 Books are available to learn some of the finer details of how to survey and draft cave maps. 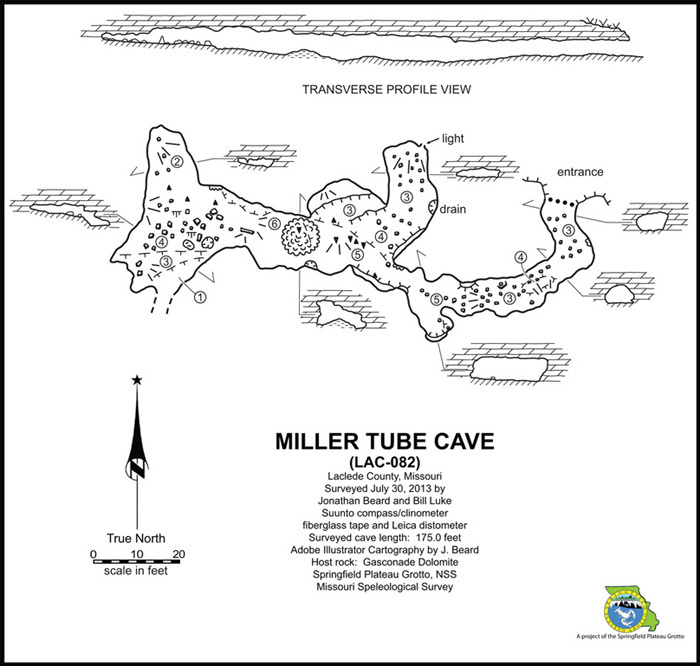 A local favorite, written by the late Robert L. Taylor and the late Dr. Ken Thomson is entitled “The Art of Cave Mapping” and is available through the Missouri Speleological Survey as Volume 31 of Missouri Speleology, the journal of the MSS. The National Speleological Society produces another book entitled “On Station” edited by George Dasher. Since 2006, SPG cave survey teams have completed more than 225 cave surveys and produced maps showing the characteristics of these caves, ranging from minimal short caves to long caves exceeding a mile in length. 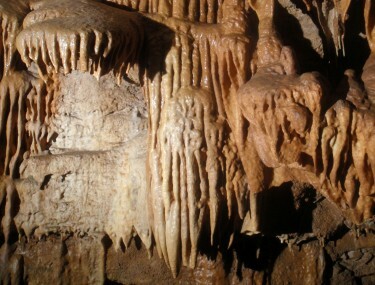 Although our efforts have focused primarily on caves in the Springfield, Missouri area, such as Greene and Christian Counties, caves in McDonald, Newton, Barry, Lawrence, Cedar, Hickory, Polk, Pulaski, Laclede, Camden, Dallas, Webster, Wright, Douglas, Ozark and Taney counties have been mapped, as well as a few caves in Kansas and Arkansas. Besides our own personal projects, SPG survey teams have assisted other caving clubs and the Cave Research Foundation in the surveys of caves in Ozark, Perry, St. Clair and other counties and caves located on federal lands (the latter of which are otherwise currently closed to human visitation due to White Nosed Syndrome cave closure policies). The following are two examples of cave maps prepared by SPG members. Currently, SPG has more than 25 mapping projects underway. If you would like to help with the projects and learn more about cave surveying and mapping, don’t hesitate to contact an SPG officer. SPG usually plans one or more survey trips every month. Cave Surveying & Mapping. Read more here. Cave Cartography & Training. Learn more. When: Monthly, second Thursday at 7 p.m.
Where: Springfield Nature Center auditorium, 4601 S. Nature Center Way, (off the James River Fwy) Springfield, MO 65804-4920. Meetings are open to the public. Discover more about the exciting world of caving and learn about safe and appropriate caving practices. Each meeting includes an educational presentation. Our Greene County and Christian County projects involve searching for undocumented caves and verifying data on documented caves. In the last two years, we have found more than 70 undocumented caves and produced maps of the interiors of many of these caves. Our projects offer photographic opportunities, even in places never before seen by humans. Contact Us to find out more.